HG Logistics News Do You Believe In The Impossible? Do You Believe In The Impossible? On Friday, October 12, 2012, I experienced something that probably will never happen again. Therefore, I felt compelled to write about it or at least record it somewhere as proof that the impossible is possible. 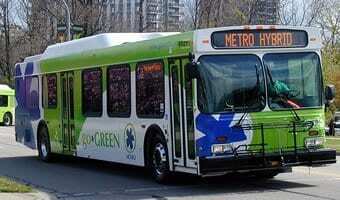 As I mentioned in previous blogs, I ride the bus to and from work each day. The route my bus travels is very busy and it does not take long for the bus to be filled to capacity. We are packed in like sardines–every seat and aisle space is filled. As hard as you may try, you can't help but brush up against the person sitting or standing next to you. You come to expect these conditions; you accept them and make the best of the situation. Some may find these conditions deplorable, especially if you are claustrophobic, but for me, this is a “normal” part of my daily routine. On Friday, October 12, 2012, I found myself doing what I always do at 5:00 p.m. –standing at the bus stop waiting for my ride. As I waited, I double checked to make sure I had the correct change for bus fare, and I worked to condense all my belongings into one bag. That way I was assured to have one free hand to hang on with. After all, I was certain I would have to stand–the norm on the start of my bus trip home. Anxious to start the weekend activities, I was thrilled to see Bus 33 coming in my direction and on time. But this was nothing compared to what I saw next when my bus pulled up to the stop. There, all by herself, sat one lone bus driver, with NONE, I say ZERO passengers. You could maybe expect this in early or mid afternoon but not at rush hour. I was shocked. I immediately thought, “What is wrong with this bus?” I even hesitated to get on. I asked the driver, “Where is everyone?” She explained that she was called in as extra help because Cincinnati Metro was anticipating larger than normal crowds due to the fact that the Cincinnati Red's playoff game just ended approximately 15 minutes ago. I was not complaining. It just felt strange. I had my choice of seats. There was complete silence, except for the rumbling of the bus engine and the whisking by of passing traffic. There was no worrying about accidently bumping the person next to me. We did not even have to stop to pick anyone up, so there was not the usual jerking that comes with stopping and going. We just kept traveling at a slow steady pace. From the time I was picked up until the time I reached my destination, I was the sole passenger. I had VIP service. I was able to sit back and relax. I closed my eyes and rested and by the time I stepped off the bus, I felt totally refreshed. I mentally bookmarked this as a memorable once in a lifetime experience. To some this may seem silly, but I am amazed when something totally unexpected happens and even more so when it is something wonderful, something I had no control over, something I consider a little bit of heaven on earth. With all my efforts, I could never orchestrate something like that to ever happen again. So I can either look at this whole situation as a freak accident or as a blessing from above. I would like to believe it is the latter. So after putting in a full week at HG Logistics LLC, a third party logistics company and freight transportation broker in Cincinnati, Ohio where we strive to provide the best transportation service available from pick up to delivery, someone thought I deserved a special travel time of my own. To whoever is responsible, I thank you for the ride of a life time.